This was one of my favorite kid meals to make when I was young – Hot Dog Wrap Up! It is super easy and great, especially when you don’t have any hot dog buns in the house. All you need is one piece of bread, some butter, a piece of cheese, a hot dog, and some toothpicks! 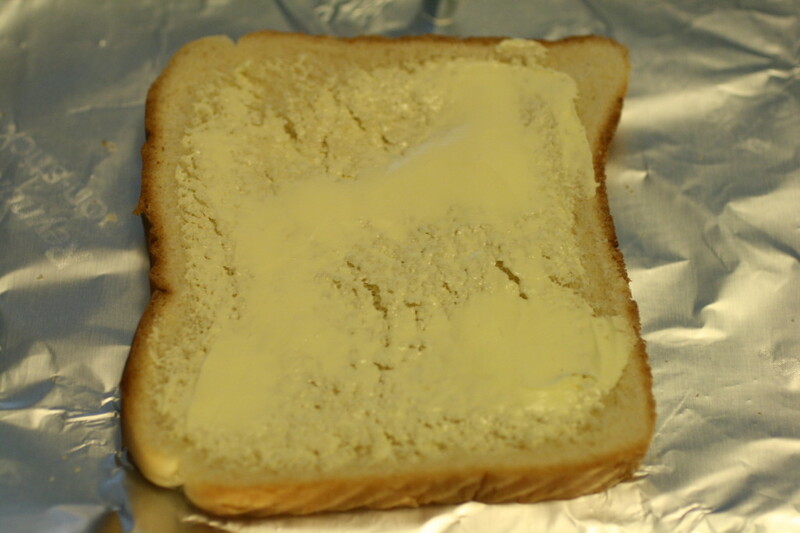 I start by spreading butter on one side of the bread and place that butter side down on a baking sheet. 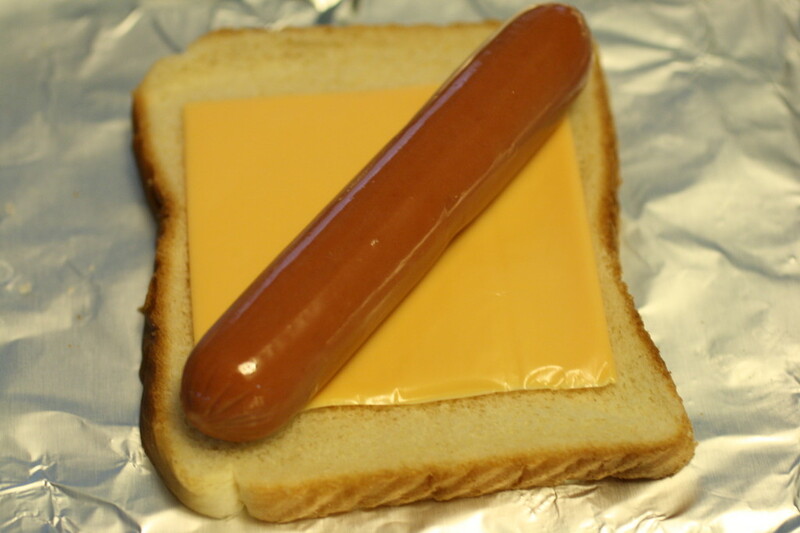 Next, place a piece of American Cheese on top of the bread and lay the hot dog diagonally across the piece of bread. I normally use nitrite free turkey dogs – yummy! 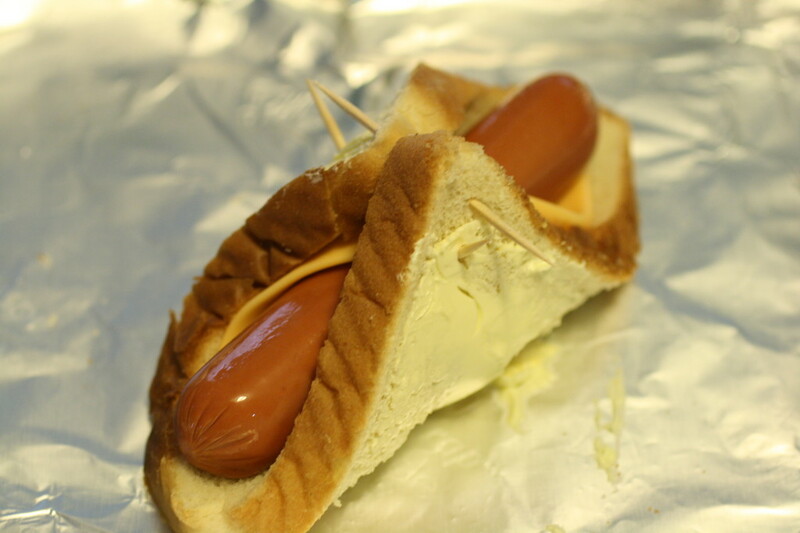 Finally, wrap up the sides to form a tent across the hot dog. Secure with 3 toothpicks – one on each side and one through the top of the bread pieces. Bake at ˚350 for 10-13 minutes, until the bread is toasted and the cheese melted. Remove the toothpicks and enjoy with some ketchup or BBQ sauce to dip in! One word of caution, the cheese is VERY hot when this comes out of the oven and could burn little mouths. Let it cool down for a few minutes before eating. 1. Butter one side of the bread and place butter side down on a baking sheet. 2. Place the cheese slice on the bread and then lay the hot dog diagonally on the bread. 3. Fold the sides up over the hot dog to make a tent and secure with toothpicks! 4. Bake at ˚350 for 10-13 minutes, or until the bread is toasted and cheese is melted. Enjoy!